Stories of family and ancestors who lived and worked in Cohoes (textile and garment workers, butchers and barbers), Waterford (canalers), Whitehall (farmers and canalers), Port Henry (iron miners and Civil War soldiers), Champlain (canalers and farmers) and other towns along the Champlain Canal in New York State with some diversions to the places they emigrated from....Quebec (landless farmers, shoemakers, sailors, soldiers), Acadia (more farmers), and even Cornwall, England (tin miners). In the colonial period, the border between the French colony of Québec and the English colony of New York was not clearly established. Until the end of the French and Indian war, it was quite fluid. Each colonial power tried to maintain a presence or "outpost" to intimidate and control the other. Hostile expeditions on the frontier or borderlands was ever ongoing: Champlain attacked Iroquois villages in the Mohawk Valley in 1615. The French Carignan Salieres regiments made expeditions as far as Schenectady in 1666. In retaliation for the English colony's massacre at LaChine, Québec, French marines and allies attacked Schenectady in 1690. At the dawn of the 18th century, European countries and dominions fought the War of Spanish Succession because they feared France and Spain might unite under Philippe IV to form one country much too powerful. The war was also fought on three fronts in North America: Spanish Florida and the English colony of Carolina, the Atlantic Provinces of present day Canada AND in the land now called New York, New England and Québec. Indigenous peoples often fought the battles serving as proxies for the European powers. When it was finished, all parties except the indigenous peoples signed a treaty together often called 'The Treaty of Utrecht". "In 1712, Britain and France declared an armistice, and a final peace agreement was signed the following year. 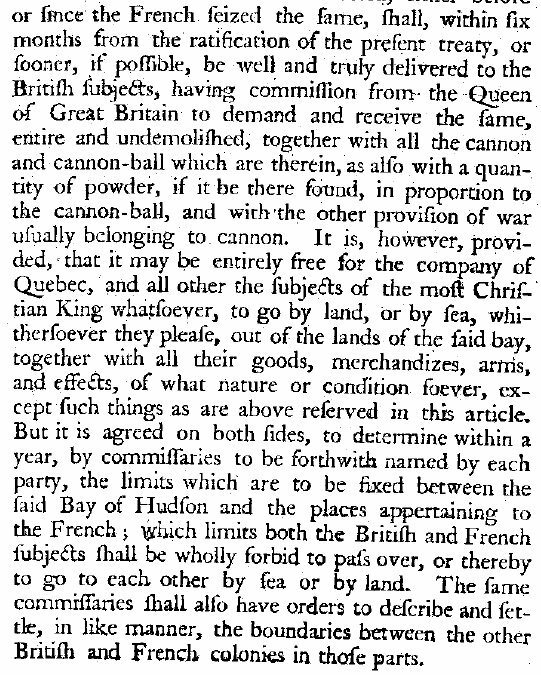 Under terms of the 1713Treaty of Utrecht, Britain gained Acadia (which they renamed Nova Scotia), sovereignty over Newfoundland, the Hudson Bay region, and the Caribbean island of St. Kitts. 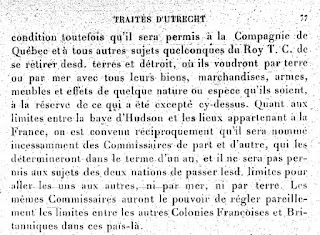 France recognized British suzerainty over the Iroquois, and agreed that commerce with Native Americans further inland would be open to all nations. It retained all of the islands in the Gulf of Saint Lawrence, including Cape Breton Island, and retained fishing rights in the area, including rights to dry fish on the northern shore of Newfoundland." 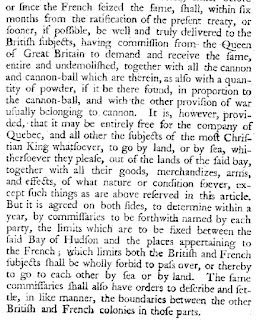 The treaty does not have a specific item identifying the borderlands between Québec, New York and the New England colonies. As I read the English version of the treaty, it would appear to postpone settling a border. 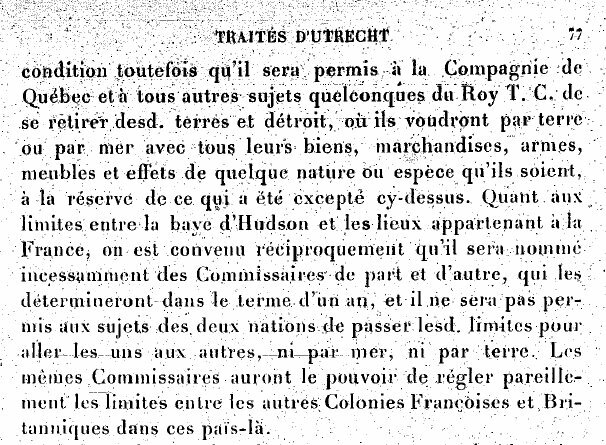 After describing the agreement regarding Hudson Bay, the last line of item IX states "The same commissaries shall also have orders to describe and settle, in like manner, the boundaries between the other British and French colonies in these parts." Of course, to the indigenous people, the total concept of a treaty written and signed in Holland to parcel up their lands and give certain entitlements to other powers must have been a gruel joke. New York State history books usually state that the Treaty of Utrecht established a border south of which the French were not to settle and this borderline was known to be "Split Rock" on the western shores of Lake Champlain. I cannot find that particular wording in the treaty. I wonder if the French couldn't find it either. It seems that the French had a vastly different interpretation of the terms because they later settled 25 miles south of Split Rock at Fort St Frederic (present day Crown Point, NY) - 25 miles south. Then they built Fort Carillon (present day Ticonderoga) 16 miles south of St Frederic!!! Until I can find the original source where Split Rock was designated the mark, I will continue to go with the New York State history books. If anyone reading this can point me to the primary source and lines in the Treaty of Utrecht, I would be immensely grateful! Thank you. Wilder, Thornton. The Bridge of San Luis Rey. 1927. ...may not seem particularly easy. I post information and stories in whatever sequence comes to me and sometimes it doesn't make a whole lot of sense. I may post about someone and three weeks later write about them again. In between the two posts, there may be stories about other people or places. That is why there is a search button at the bottom of this page. Copyrighted by FrancoAmericanGravy, USA 2010-2015. Watermark theme. Powered by Blogger.